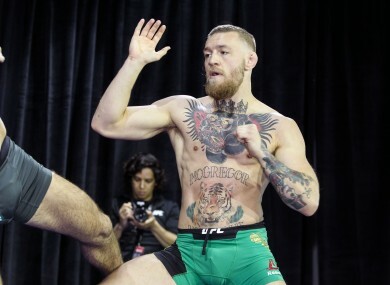 McGregor is “up for” fighting Robbie Lawler at UFC 200. Conor McGregor at last night's UFC 196 open workouts at the MGM Grand in Las Vegas. THINGS HAVEN’T QUITE worked out according to plan but Conor McGregor is still eager to challenge for the UFC’s welterweight title this year. McGregor faces Nate Diaz in a welterweight bout at UFC 196 in Las Vegas this weekend, but the reigning featherweight champion was originally due to challenge lightweight title-holder Rafael dos Anjos in Saturday night’s main event. That scuppered McGregor’s hopes of accumulating three UFC belts by this summer. Following a potential dethroning of dos Anjos, speculation suggested that McGregor would be catapulted into a welterweight title fight against Robbie Lawler at UFC 200 on 9 July. Nevertheless, the 27-year-old Dubliner still isn’t ruling out a clash with Lawler next. When asked about that prospect at last night’s UFC 196 open workouts at the MGM Grand, McGregor issued a positive response and seemed exasperated by the situation with dos Anjos, who’s facing a spell on the sidelines due to a broken foot. “Yeah, that [welterweight title fight ] is there. I mean, why not? That’s probably the leading option,” McGregor told reporters. McGregor’s last outing was at 145lbs for the UFC featherweight title, but the Irish superstar has been discussing unprecedented dominance of multiple weight divisions since he knocked out Jose Aldo in just 13 seconds at UFC 194 in December. A move up to 155lbs to compete at lightweight is something McGregor has done before, having been a two-division champion for Cage Warriors in 2012. Continuing on to welterweight [170lbs] would be a first, however, as no fighter has simultaneously held two UFC belts before, let alone three. Lawler is the UFC’s second-longest reigning current champion. After taking the belt from Johny Hendricks in December 2014, the 33-year-old veteran — who made his UFC debut 14 years ago — has since made successful defences against Rory MacDonald and Carlos Condit. “I like Robbie. I won’t say a bad word about Robbie. He fights with his heart. He’s been around the game so, so long. But if we fought, I would beat Robbie. I’m too fast for him. The size difference is not anything. I’ve stood beside him, I’ve seen him,” McGregor insisted. McGregor didn’t draw the line at 170lbs either, adding that a move to the middleweight division (185lbs) isn’t something he’d dismiss: “Who knows? I could be like a block at 170. As I keep growing, keep eating, keep training, my body could change as I get older. Regarding his future in the featherweight division, where he’s the current champion, McGregor explained that he could return to 145lbs “no problem” but there’s “nothing appealing” for him there at the moment, as The42‘s Niall Kelly reported from Las Vegas overnight. Email “'I would beat Robbie... That's probably the leading option' - McGregor keen on 170lbs title next”. Feedback on “'I would beat Robbie... That's probably the leading option' - McGregor keen on 170lbs title next”.